12 Variations on 'Ah, vous dirai-je, Maman' - KV 265 (300r) composed by Wolfgang Amadeus Mozart (1756-1791). Edited by Ewald Zimmermann. For Piano. Piano (Harpsichord), 2-hands. Henle Music Folios. Urtext edition-paper bound. Classical Period. SMP Level 8 (Early Advanced). Single piece. K.265(300e). 10 pages. G. Henle #HN165. Published by G. Henle (HL.51480165).Only very few piano works have become as popular as this theme with twelve variations. 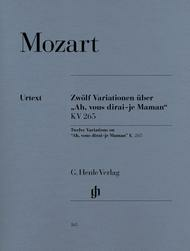 It already caught on soon after Mozart's death, as witnessed by the numerous handwritten copies and prints. Although nothing is known with any certainty regarding its genesis, we can now conclusively date "Ah, vous dirai-je Maman" to 1781. At that time Mozart wanted to make his way as a prominent piano teacher in Vienna. His variations still prove to be excellent teaching material. Our edition has been completely revised and also offers an extremely informative preface by the Mozart specialist Ulrich Konrad.This title has selections that range in difficulty from SMP Level 7-8.About SMP Level 8 (Early Advanced)4 and 5-note chords spanning more than an octave. Intricate rhythms and melodies.